If you are looking for marketing data to capture business opportunities in the NetSuite applications space, Blue Mail Media’s NetSuite Users Email Database can be a huge enabler. Our mailing list comprises of comprehensive data to help you connect with your most potential prospects via telephone, email or mail. With Blue Mail Media’s NetSuite Customer Email List, marketers can reach out to a large number of decision makers, C-Level Executives, and professionals based on their region of focus. We have been able to build a strong network of data partners across regions such as the US, the UK, Canada, North America, Africa, Europe, India, China, Australia, New Zealand, amongst others. This enables our team to serve clients without any geographical barriers. Blue Mail Media uses various traditional and modern techniques to collect data from multiple sources. To ensure that our NetSuite Users Customer Database is best in class, we verify and update our data in every 45 days and put immense efforts to keep it qualitative and reliable for our clients. Also, we are highly professionals and flexible in our approach to serve clients. 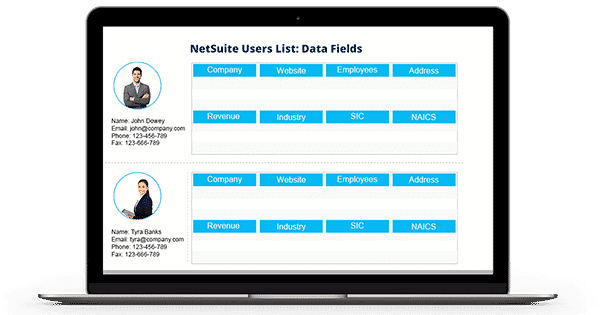 We offer to customize our NetSuite Customers Database based on the specific requirements that you may have or provide a pre-packaged database for your immediate multi-channel marketing needs. With our NetSuite Users Mailing List, you are sure to achieve a greater response rate, conversion rate and ROI. Get in touch today to know more.